Is there a better alternative to Badia IDML Import? Is Badia IDML Import really the best app in Desktop Publishing category? Will Badia IDML Import work good on macOS 10.13.4? Badia IDML Import is an XTension for QuarkXPress 2015 that allows you to easily import IDML files created with Adobe InDesign into QuarkXPress. 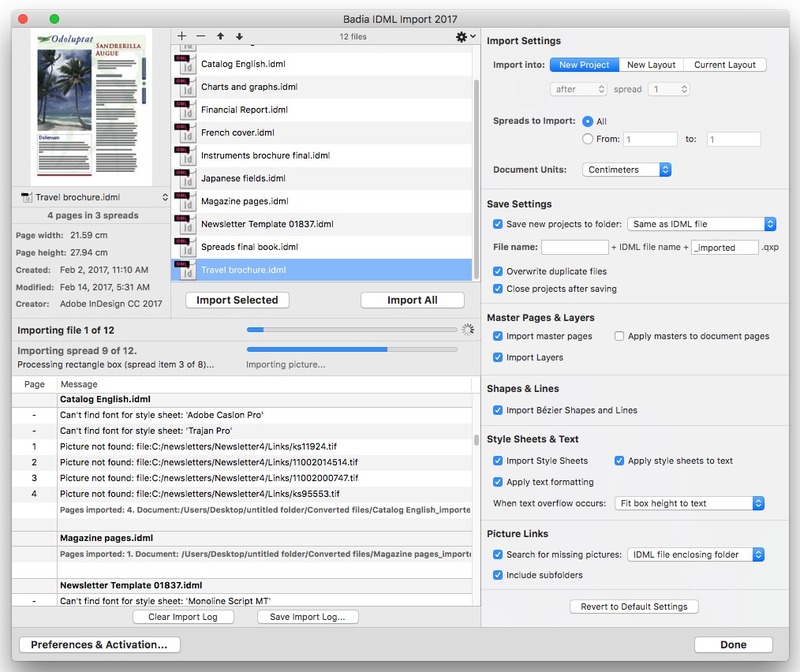 In just seconds, IDML Import will build all document pages and spreads; import colors, master pages, style sheets, and layers; create all text boxes, picture boxes, vector shapes, tables, frames, and groups; format text stories; and import all graphics. And since IDML files are supported starting with version CS4 of Adobe InDesign, you can import any IDML file created with InDesign CS4, CS5.x, CS6, CC, CC 2014 or CC 2015. Note: Version 2.0.0 is a paid upgrade. You can upgrade by going here. Note: New version for QuarkXPress 2017 only. Badia IDML Import needs a review. Be the first to review this app and get the discussion started! Badia IDML Import needs a rating. Be the first to rate this app and get the discussion started! Several other fixes and improvements .